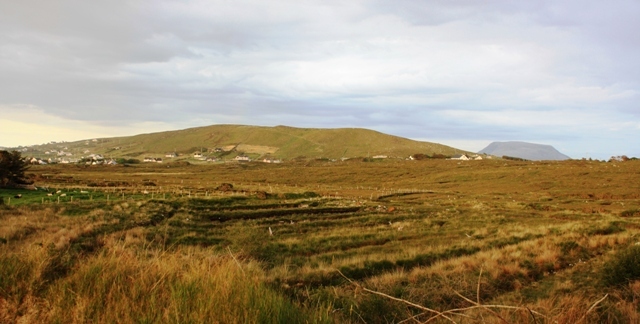 Crocknaneeve enjoys a position which gives excellent views south across to the Errigal-Aghla ridge of hills and the mighty whaleback summit of Muckish. It also allows lovely views at sunset on clear evenings out to sea and nearby Bloody Foreland. One approach from the north is as follows: Use the minor road at B 87888 33001 A to reach a junction of a bumpy track at B87820 32438 B. A few hundred metres up this track will bring you to the summit area. 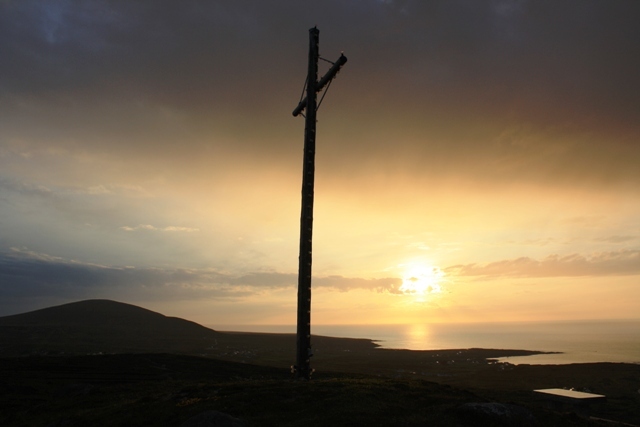 There is a large cross and altar near the summit, and there are Stations of the Cross along the road and around the hill. From the south find a small abandoned white farmhouse just alongside the minor road around B873316 C, with room for one car nearby. From there it is a quick, easy ascent on open ground up to a flat area,; then a short stroll through boggy, uneven terrain to reach the road. Follow it for one or two hundred metres until you meet the road/track junction mentioned above. This will lead you straight to the summit and the cross. Climbed this small hill on 14. June 2013. There is a small abandoned white farmhouse just alongside he minor road S of the summit, somewhere around B873316 C, and room for one car nearby. 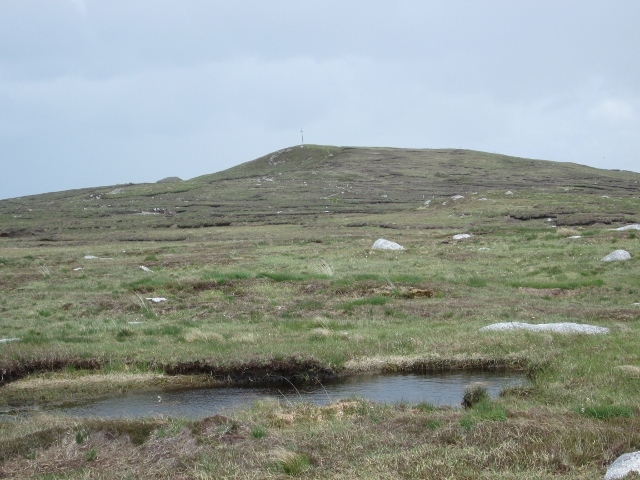 From there it is a quick, easy ascent on open ground up to the flat area which can be seen on the picture; then a short stroll eastbound through boggy, uneven terrain (old turf cuttings I believe) will take you to a winding road track. 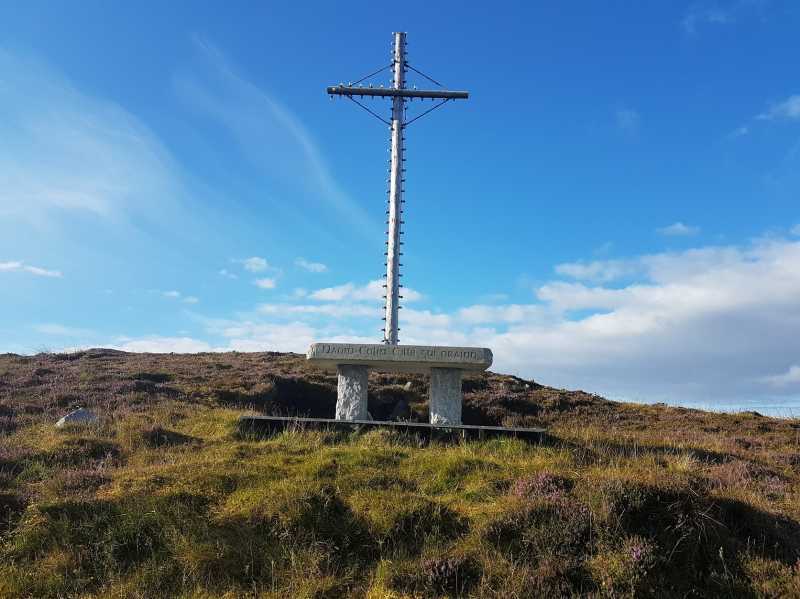 Follow it for one or two hundred metres until you see a small track to your right -which can be seen to the right of the cross on the picture- that will lead you straight to the summit and its wooden cross. As I made it to the top, the wind had suddenly grown stronger and the bit of rain that had started falling had almost turned into hail, with the mist coming down too, so I could not really enjoy the coastal scenery to the N, which must be great on a clearer day. And as usual, it cleared up just after I left the summit ! Was able to enjoy nice views during the ascent and descent though, towards Cnoc Fola to the W, Taobh an Leithid to the S and the Seven Sisters to the SE, including the almost perfect triangle shape of mighty Errigal. A friend of mine who lives in the area had advised me to climb one of the lanes starting N of the hill from Min Larach, but as I could not define which lanes were private or not, I decided to start from the SW and it happened to be a good idea (no fence nor gate to cross). He also told me there was an annual local pilgrimage/procession up to the cross, but I cannot remember which part of the year it takes place. I will update this comment as soon as I get the answer (has anyone heard about it ?). Picture from sandman : Summit Cross.